I walked into the ballroom – surrounded by tuxedos and long revealing gowns. An orchestra was playing a song from Our Town. People stood together, as if protected from their fate. I looked towards the door, but I knew it was too late. Too late to leave, too early to stay. Play me that sad song the one we used to play. Song called, “Evergreen” from another lifetime ago. Do you remember the way I held you as we danced so slow. Where are you – is it too late for you to get here? Is it too soon for you to believe? I can see you standing against the wall – would you like to dance with me? A piano is playing, an older man tickling the keys. playing a song for dancing, playing a song for you and me. “Touch me in the morning…” We stood close together, through the window we can see the stormin’. “Then just walk away…” Your arms around my neck, my arms around your waist. 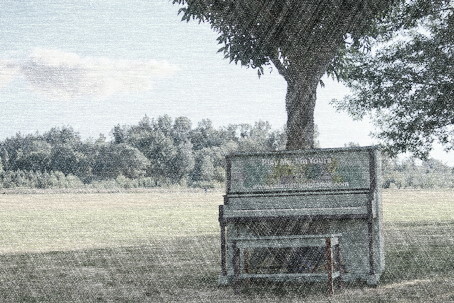 “But we had yesterday…” The piano stops and the orchestra is silenced. The doors open and we walk out as one – tuxedos and long revealing dresses, piano man and the storm. I put my arm ‘neath yours – you place your head on my shoulder. The orchestra begins to play a song as we walk through the doors. The music fades as we walk in the rain – we walk towards a tree and we stand beneath it. The roots of our love keeping us warm – keeping us close. Lightening and then Thunder – striking 100 times for you and me. While the old man sits by the piano – playing that old song for you and me. Together through life – each other’s stories run together like the days and nights of our time…our tree has blossomed and its growing so fast – if we don’t have tomorrow our yesterday will keep our memory alive forever.